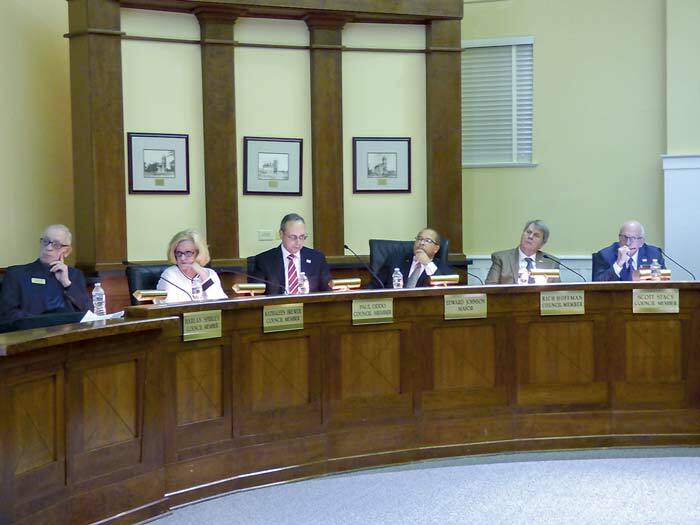 The Fayetteville City Council on Feb. 7 heard proposals that would establish City Council committees and a Downtown Planning Committee populated by three council members and eight appointed community members. The council will vote on the items on Feb. 21. City staff recommended approval of an ordinance that would create a Downtown Planning Committee. Staff said the committee would be responsible for developing and updating the long-range plan for the future of the city’s Downtown District, which will provide a long-range blueprint detailing the investment of resources, including human talents, needed to ensure the district’s future economic success for its businesses and improved quality of life for its residents. The committee would consist of three council members and eight community members who will be appointed by the Mayor and Council. City staff also proposed that the council establish four City Council committees covering areas such as public services, community and economic development, public safety and finance administration. A notice of all committees meetings would be posted, with committees bringing their findings to the full council for consideration and review. The objective of the committees is to enhance communication between the City Council and city staff at the early phase of the development of significant items affecting public policy questions. The committees would enable city staff to receive early feedback from those council members serving on the committees. No council member could serve on more than three committees. The Public Services Committee will hear matters relating to the physical services provided by the city such as street and alley maintenance, solid waste collection and recycling, sewer including the wastewater treatment plant, water, stormwater management, and facilities maintenance. The Community and Economic Development Committee will hear matters relating to community development, zoning, historic preservation, building codes, block grants, housing projects, workforce development, business improvement districts, city public relations, industrial park development and marketing, revenue bonds, and cultural arts. The Public Safety Committee will be concerned with issues brought forth from the fire, police, emergency management services departments as well as traffic control, emergency medical services and parking. The Finance Administration Committee will consider appropriations, finances, taxation, revenues, labor relations, professional development, personnel, pensions and other benefits, insurance, audits and the city budget.